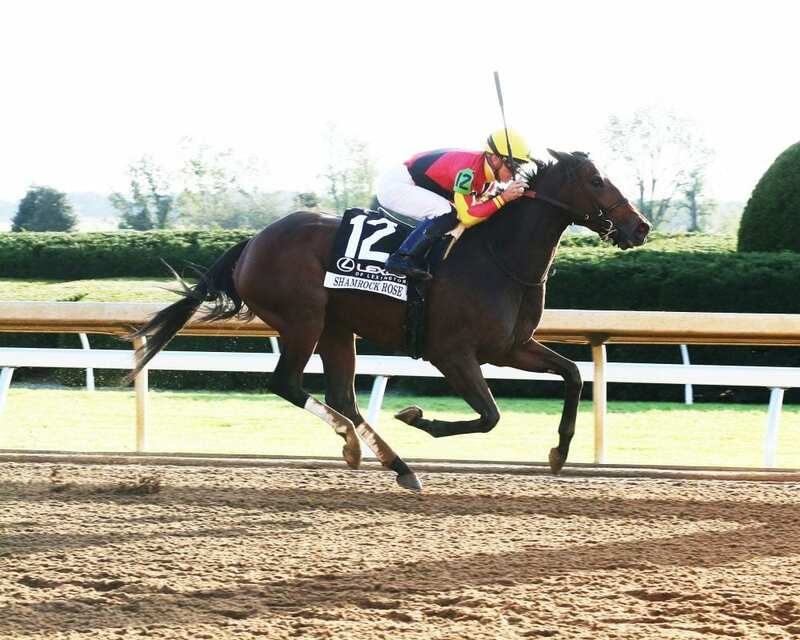 Conrad Farms' Shamrock Rose raced by pace-setting Blamed inside the eighth pole and drew off to win the 20th running of the $250,000 Lexus Raven Run (G2) for 3-year-old fillies by 2½ lengths before a Saturday afternoon crowd of 23,567 at Keeneland. Trained by Mark Casse and ridden by Tyler Gaffalione, Shamrock Rose was written off as a synthetic specialist and paid $39.40 to win. She covered the 7 furlongs on a fast main track in 1:22.98. Blamed, under Julien Leparoux, grabbed the lead shortly after the break and led the field of 14 through fractions of :22.27 and :44.83 with favored Moonshine Memories in closest pursuit and Shamrock Rose racing about four lengths off the lead. Blamed disposed of Moonshine Memories at the top of the stretch, but Gaffalione had Shamrock Rose rolling in the four path and the outcome was never in doubt from the sixteenth pole to the wire. A Pennsylvania-bred daughter of First Dude out of the Elusive Quality mare Slew's Quality, Shamrock Rose won her third consecutive race and first graded stakes. In her previous two starts, she had won stakes on all-weather surfaces at Woodbine and Presque Isle Downs. The winner's check of $150,000 boosted her earnings to $367,687 with a record of 9-4-2-1. Shamrock Rose returned $39.40, $17.20 and $10.40. Blamed, who was making her first start in nearly seven months, returned $10.20 and $8.40 and finished 1½ lengths in front of Take Charge Paula, who paid $13 to show under Florent Geroux. It was another 1¼ lengths back to Bronx Beauty in fourth with Everyonelovesjimmy, Amy's Challenge, Kelly's Humor, She's Pretty Lucky, favored Moonshine Memories, Chauncey, Divine Queen, True Royalty, Criminal Mischief and Alter Moon following in order. This entry was posted in Racing and tagged blamed, conrad farms, julien leparoux, Keeneland, Mark Casse, moonshine memories, raven run, Raven Run Stakes, shamrock rose, Tyler Gaffalione by Edited Press Release. Bookmark the permalink.